Product design often revolves around personal devices – to be used and held by individuals. In this respect, they can often act as tools which give the user a sense of ownership and control. Matt Canham’s hplus is a collection of six personal medical devices which aim to relieve pressure on the patient, doctor and health service. Together they provide accurate monitoring of nine major chronic health conditions. 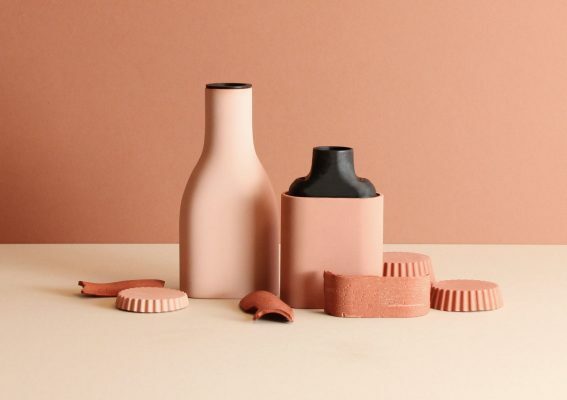 Inspired by ceramic tableware and vessels, the devices are designed to counter the clinical aesthetic of medical products, giving users a sense of dignity through their use while grounding them in a domestic environment. Similarly, Yoahan Gu’s WHEELS4U presents a product-based solution to a problem which affects individuals, families and communities. Many disabled children who live in rural areas of China don’t have access to assistive products. WHEELS4U is a low-cost children’s wheelchair which incorporates utilitarian objects such as washbasins, recycled children’s bikes and locally sourced materials. 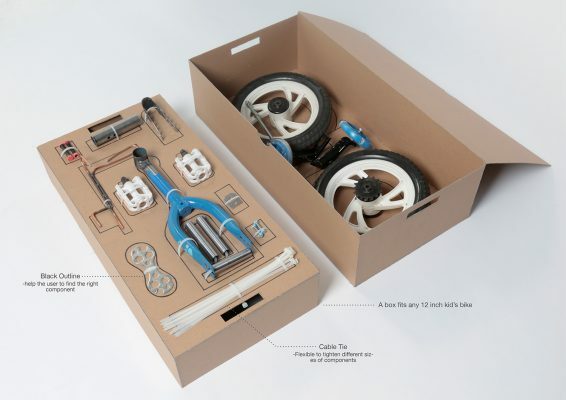 With an instruction book included, children can easily assemble, adjust and repair their own affordable wheelchairs by hand. Through simple, low-cost methods, this product allows children to retain control over their own conditions. Product Design can also help break down gendered stereotypes in advertising and the use of everyday objects. Taeheon Kim’s Croono is a modular makeup brush for men that enables them to define and assert their own masculinities. Despite an increased interest in men’s skin care and makeup, available products often remain targeted at women. Croono is designed to deconstruct gender barriers, enabling both men and women to participate in formerly segregated consumer activities. 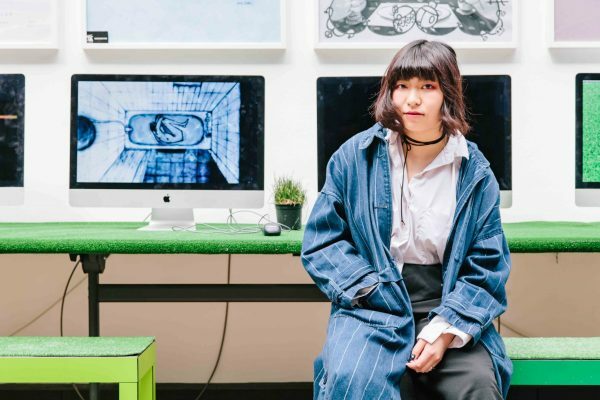 Using clothing as an empathetic tool, BA Fashion Design Womenswear graduate René Scheibenbauer has created Empathy, connection, play – a collection of clothing items designed to carry the quality of therapeutic tools. Interested in the relationship between our fashion choices and emotional states, Scheibenbauer ran a series of workshops in which participants were blindfolded and invited to explore emotional and physical sensations through drawing, performance and sculpture. Working in collaboration, the resulting collection is both personalised and universally empathetic. Scheibenbauer demonstrates that fashion design can foster understanding and resilience and what we wear can also play a conscious part in how we feel. 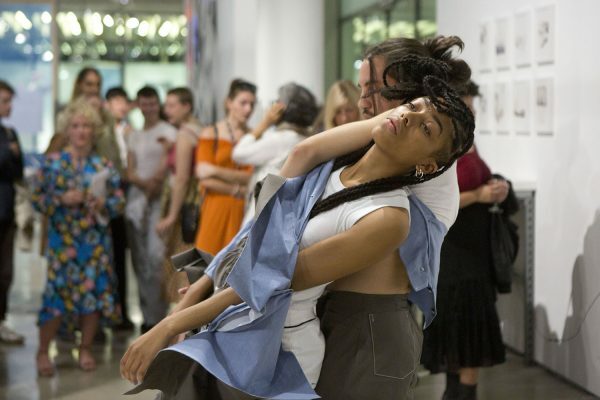 For the Private View during London Design Festival Scheibenbauer devised a performance in which two performers, joined through clothing, moved and danced in tandem through the gallery. MA Design (Furniture) graduate Chloé Durán Stone’s designs focus on the relationship between user, space and object. 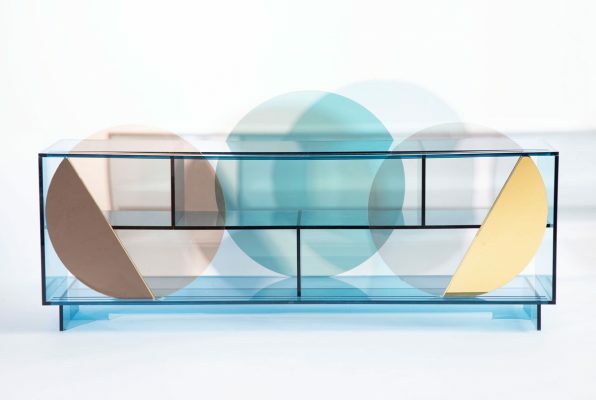 The pieces in her Bo’oy collection – meaning shadow in the Mayan language – consist of reflective and translucent coloured forms which transcend their functional purpose. Using light and colour to influence our mood and well-being, Durán Stone’s adaptable designs aim to trigger the senses and enhance the space around them. The designers in this section of Creative Unions are not solely concerned with object-based design. 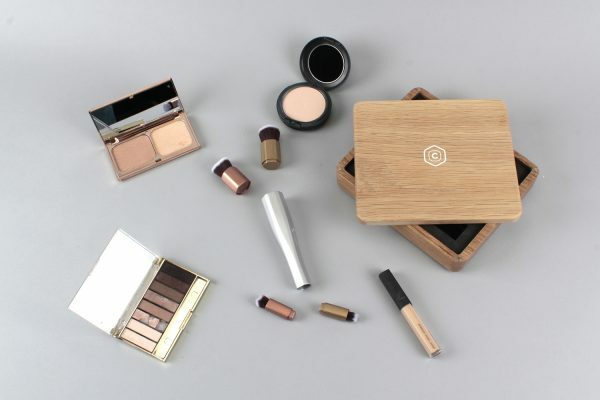 MA Industrial Design graduate Elsa Bardout’s project MYCELIA is an educational website plugin that informs online shoppers about sustainable farming practices and why they matter; it allows farmers and distributors to notify customers about their processes and methods. MYCELIA harnesses the political power of the consumer’s choice to help sustainable farmers develop their practices, while also giving them an easy way to communicate what they are doing. This section of the exhibition also includes four film works which address human states, systems and self-reliance in different ways. Siobhán Smiths’ Stitch is an animated short film which highlights the need for change in the way society treats those who are ill or disabled in the UK. The film follows Harry as he undertakes an interview which will decide if he can continue receiving benefits. 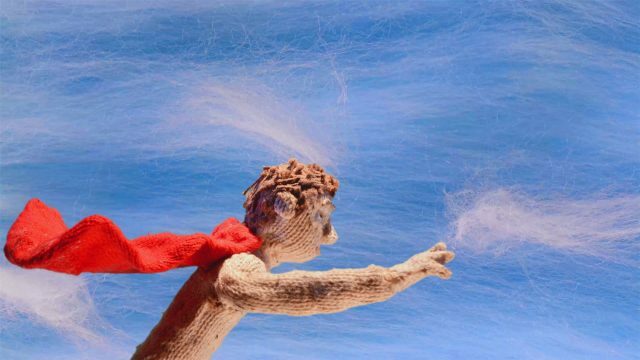 The tough, unforgiving exchange forces him to retreat into his imagination – a softer world, full of wool and crochet. Fellow MA Character Animation graduate Shuna Luo’s animation -6.831 miles tells the story of a depressed man addicted to tiny spaces who has a particular habit: he can’t really fall asleep in his bed. The only places that make him feel calm and able to sleep are enclosed spaces such as the bath tub, the wardrobe or under the bed. Visualising the invisible states of depression, Luo’s film addresses the universal and personal states of human neuroses. Taking a more comedic approach to human resilience, Reggie Hung and Ittisak Aeksomboonsin’s film Unsung Hero follows an over-tired accountant as he works throughout the night. Fighting drowsiness, he finally succumbs to sleep. Seemingly coaxing the accountant away from his work, graphics protrude from his computer screen. Fortunately, there is a group of coffee beans determined to keep him awake at all costs – sacrificing themselves for his caffeine injection. 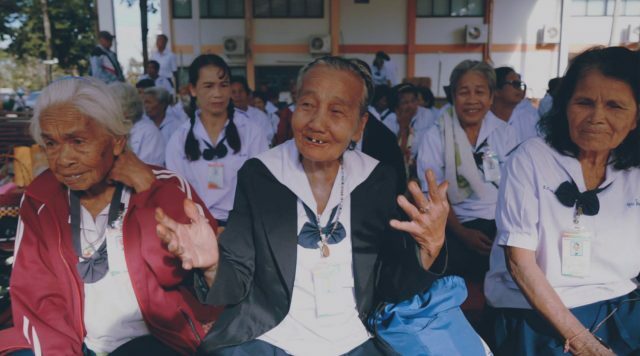 BA Graphic Design graduate Bee Supavara’s film Naphu School for the Elderly is a documentary about a school in Udonthani, Thailand where the age of students starts at 60. Supavara discovered the school while researching the role of design in combating the loneliness and social isolation elderly people can suffer from. By documenting daily life at school, including cooking, singing and dancing, Supavara hopes to “spread happiness and encourage people to connect more.” The film is a great example of the role of design in encouraging empathy within our own communities and beyond. Keep an eye on our Stories for in-depth articles and interviews with our exhibiting graduates.